The German submarine U-32 sank the Canadian Pacific Line’s 42,348-ton flagship Empress of Britain II during World War Two. The rebuilding of the Canadian Pacific fleet after the war led to the 25,500-ton Empress of Britain III entering service in 1956. The following year, they replaced their aging 26,032-ton Empress of Scotland with the 25,500-ton Empress of England. The Canadian Pacific Line then ordered Empress of Canada to give them three modern liners on the Britain - Canada run. 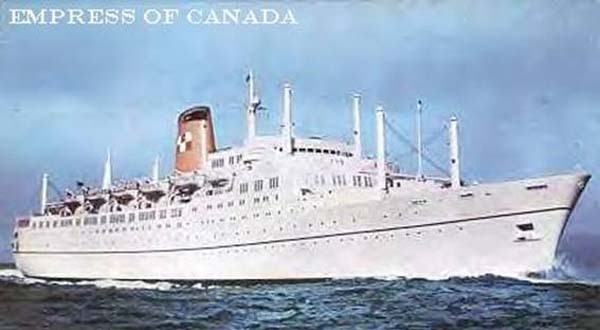 Empress of Canada entered service on the Liverpool - Montreal run April 24th 1961. The dramatic increase in the aircraft industry over the following decade forced the Canadian Pacific Line to start selling their ships. Empress of Britain was sold first in 1963 with Empress of England following in 1970. After providing a service for 68 years, the Canadian Pacific Line came to an end when Empress of Canada was laid up at Liverpool November 23rd 1971. The newly formed Carnival Cruise Line bought Empress of Canada in January 1972 to be operated under the name Mardi Gras. With Carnival building up their fleet to an extent they had become the largest cruise line in the world by the 1990s, they sold the aging Mardi Gras to the Greek owned Epirotiki line in 1993. Epirotiki chartered her to Gold Star Cruises at that time to be operated under the name Star of Texas. After a short time being operated on gambling cruises from Galveston - Mexican Gulf, financial problems led to Star of Texas being relocated to Miami. Gold Star then tried to buy time from the creditors by operating her on gambling cruises out of Miami under the name Lucky Star. With the creditors closing in before the losses could be turned around, Lucky Star was returned to Greece. Epirotiki then chartered her to various companies under the name Apollon. This ship was scrapped in 2004 at the Alang ship breakers in India where all the large tankers are dismantled on the beaches.